The Lake District is a stunning place with so many untouched areas of natural beauty. I wanted to reach some of this on my mountain bike, but love walking too and so planned a little bit of a whirlwind trip. It was a drive up after work on a Friday afternoon to test both patience and driving skills. After being stuck on the motorway for some time, my sat nav then directed me through the tiniest of lanes which twisted round tight corners and with grass freely growing down the centre of the quaint little road. I was most certainly relieved to arrive to the pub, the King George in Eskdale Green our meeting point and where we were to be staying for the weekend. Annie and Buster (the Bichon Frise) had already made themselves at home by the log fire and were already well acquainted with the locals. I was immediately greeted with a cider and also news that the chefs special for the evening, steak and ale pie was on the way. It was always going to be a flying trip up to this part of the country, but I quickly felt at home. Eskdake Green provides a brilliant base for walking or cycling, both road and off road. The King George pub is situated right at the bottom of Hard Knott Pass, famous for its 30% gradient that features in the well-known and equally well respected Fred Whitton challenge. It was apparent that the weather wasn’t going to be on our side this weekend. It poured the whole time with weather warnings of heavy rain and flooding. Undeterred however we set off to enjoy some ‘real’ mountain biking and we were set within a off road cycling haven! With the River Esk also on our doorstep this gave us immediate access to the Eskdale trail. It was our plan to explore the trail and then hopefully find a nice off road climb to do. The stunning unspoilt beauty of the area just kept on coming and already I was dreading leaving, but had only just arrived. 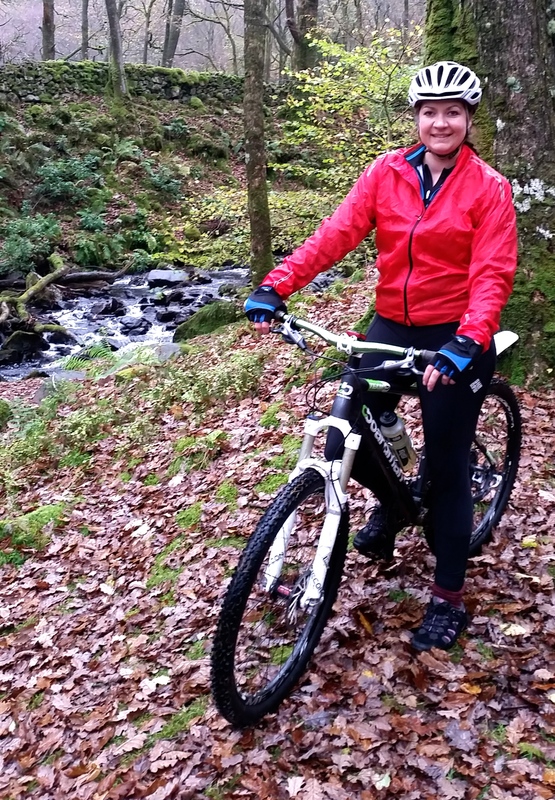 The Eskdale trail is lovely easy riding along a mixture of lanes, tracks and some fields, which were very muddy! Every corner we turned gave a new view and more stunning beauty to take in. I’m in love with this part of the country. We rode along the Eskdale Trail in both directions and then came across a sign to either continue along the trail or take the route for ‘Muncaster Fell’, which we took. Before turning a corner I heard a shout of ‘granny gear’, the signal that there’s a sharp climb ahead. I turned and then I looked up and it was clear it was going to be a slog up to the top but through a remote track through woodland on either side. I soon was feeling my front wheel lifting over the 25% gradient sections but kept pedalling in my easiest gear. The climb continued through track until we got further up and then out of the woodland. The test was then mud and lots of it up and over the fell land , a great test for bike handling skills. We could then see the top in the distance but the ride continued and the path split into two with Annie and myself taking different routes; shorter and sharper or steadier and longer. 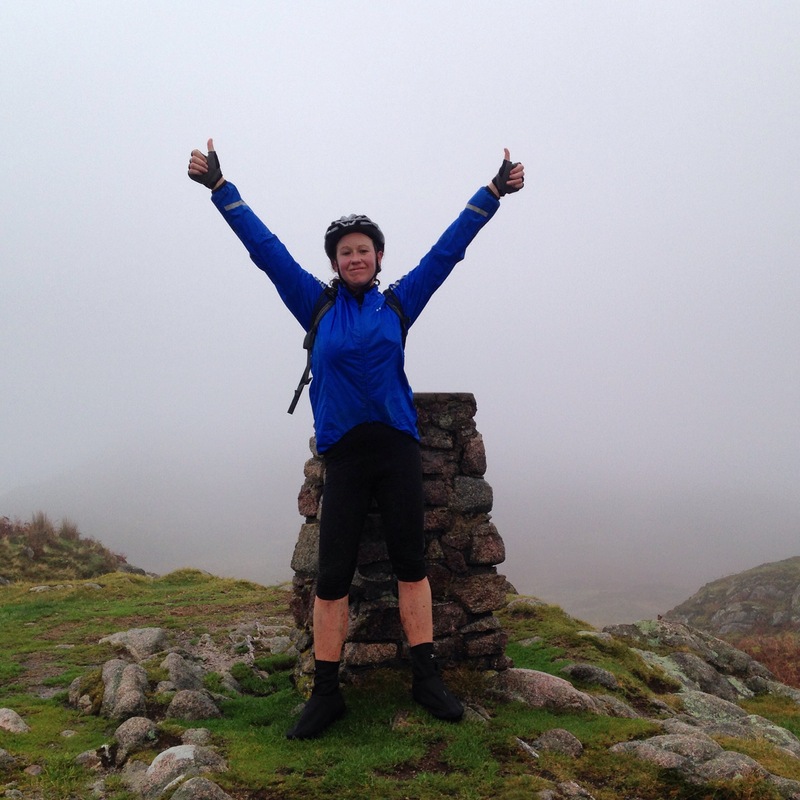 I opted for short and sharp to then bring me to the summit, which involved then pushing my bike up and watching Anne tackle the muddy and slippy obstacles in the distance. Short and sharp definitely the best decision! 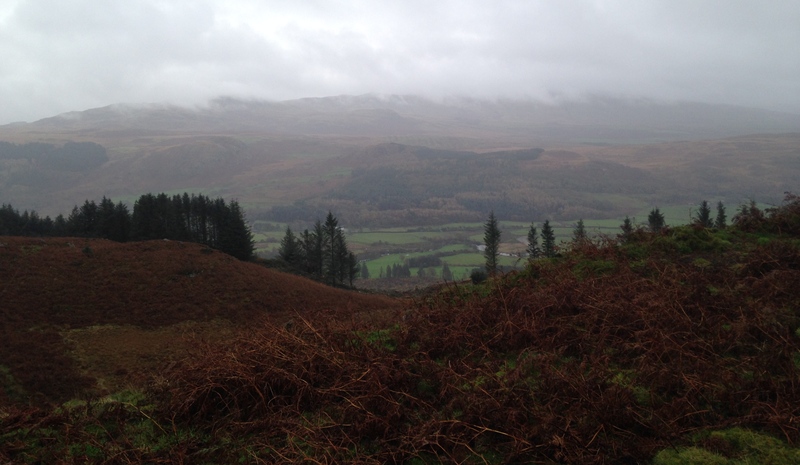 We would usually have been rewarded with stunning views over the surrounding area but on a rainy day we instead had cloud with the occasional slight break to reveal the landscape down below or further fell summits. With the cold mist and limited visibility we didn’t stick around long before making the descent down. A first mountain fell climb off road complete, a CAT 3 climb, 612ft, 1.5 miles, an average gradient of 8% and a strong sense of satisfaction knowing that once again the hard work was all worth it. 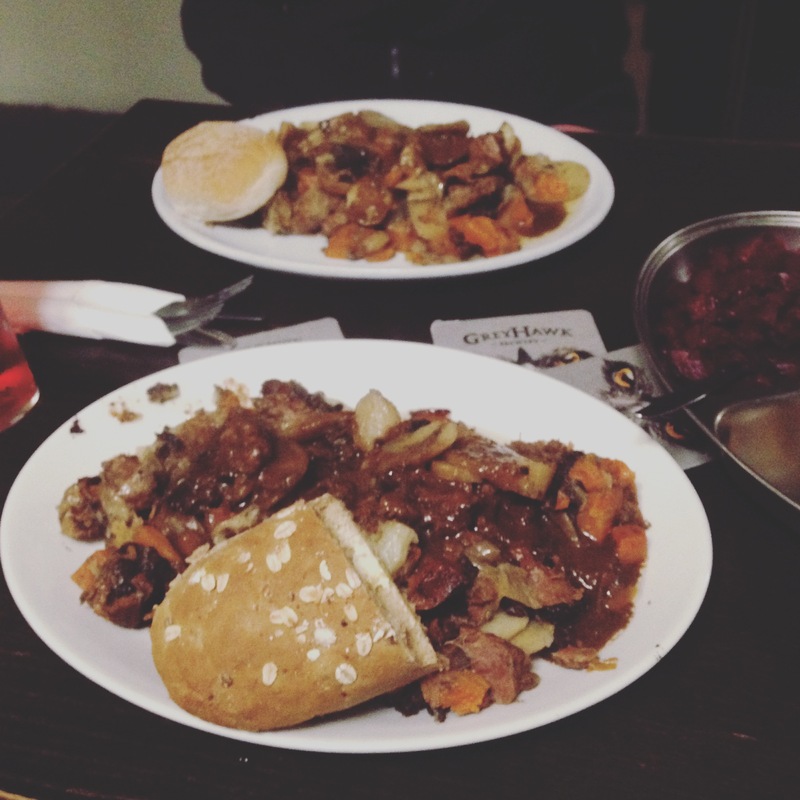 We then rode back along the Eskdale Trail to the log fire and the chefs special of the day, Tattie Pot. The rain continued to pour, along with strong winds and so we enjoyed the rest of the afternoon inside and feeling most content. I was already sad to be leaving the Lakes the next day, a weekend just wasn’t long enough. There was some walking to be done the following day before driving home. A long drive, but at the same time a journey that was certainly worth it. 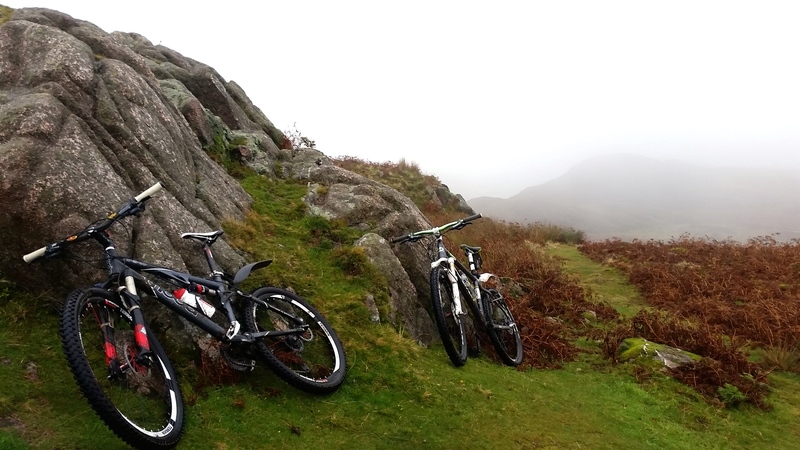 A return trip will most certainly be on the cards for 2016 for more off road riding and walking. Love this post! I loved reading about the food and the rain :) sounds like a wicked weekend. Especially the part about being greeted with cider.